Everyone knows Lea Salonga as the Disney Legend who provided the vocals of Disney Princesses Jasmine and Fa Mulan in Aladdin and Mulan. Apart from her work with the Walt Disney Company, she has stunned audiences worldwide for her Tony Award-winning runs in Broadway and the West End for her role as Kim in Miss Saigon, and both Eponine and Fantine in Les Miserables. Now, the legend is crowning a new Disney Princess at the upcoming Disney Princess: I Dare to Dream gala concert! The concert is the finale of Globe Studios’ I Dare to Dream, a first-of-its-kind, digital reality series in collaboration with Disney and Maker Studios, that will search for the next Disney Princess from a group of six young girls. Salonga will award the winner during the event, and will headline the concert featuring Disney classics. Apart from Salonga, the star-studded concert will also performances with Christian Bautista, KC Concepcion, Erik Santos, Julie Ann San Jose, Sam Concepcion, Morissette Amon, Aicelle Santos, Tippy Dos Santos, and Janina Vela. I Dare to Dream is inspired by Disney Princesses, whose stories have moved both children and adults throughout the years. For the show, Globe Studios handpicked six young girls out of hundreds who auditioned, whose personalities and values reflect that of Disney princesses. The six girls will stay in one house and undergo fun challenges while enjoying a mentorship program. The six selected girls are Sirach Catipay, an aspiring chef who wants to share the world’s cuisines with the Filipino people; Stephanie Jordan, a singing competition contestant who wants to enter the world of hosting; Hyacinth Leonado, who dreams of becoming a Broadway singer and actress; Jaden Narvios, who wants to be the president of the Philippines; Liana San Diego, who wants to be a veterinarian; and Alexi Tan, who dreams of becoming an animator. and animator Tito Romero. The girls will be joined by vlogger Janina Vela, who will serve as the guiding elder sister. The winner will also have the chance to take the trip of a lifetime: to walk the red carpet premiere of the upcoming live-action adaptation of Beauty and the Beast in Tokyo, Japan. The I Dare to Dream concert will be held on March 22, 2017 at the SM MOA Arena. Tickets are available for purchase at www.smtickets.com. You can fully experience the magic of Disney Princess: I Dare To Dream on www.idaretodream.ph. All Globe Prepaid, TM, Postpaid, and Globe At Home customers can avail of 10% discount on the tickets. Text GLOBEIDTD to 2363 to get the code. 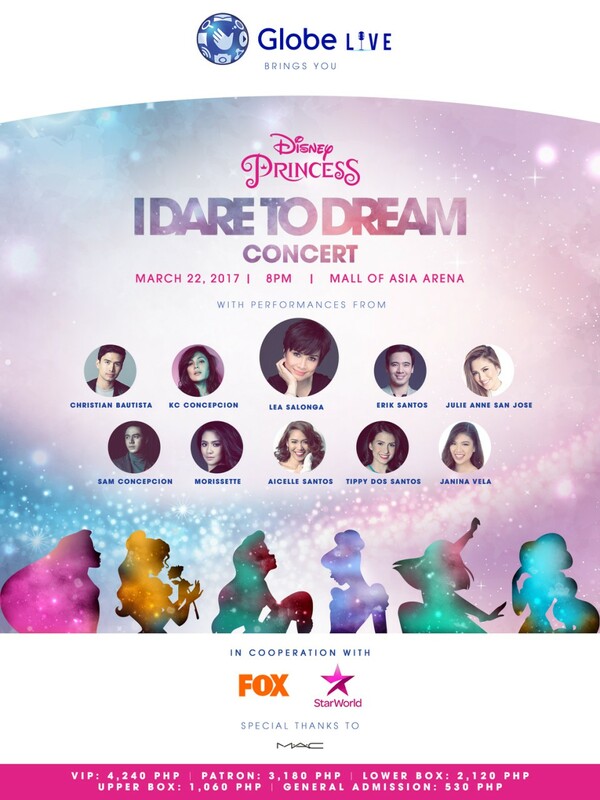 All Disney 129 & 299 customers will automatically receive a unique code from Globe to avail a 15% discount on the ‘I Dare To Dream’ concert tickets. Promo period is until March 19.